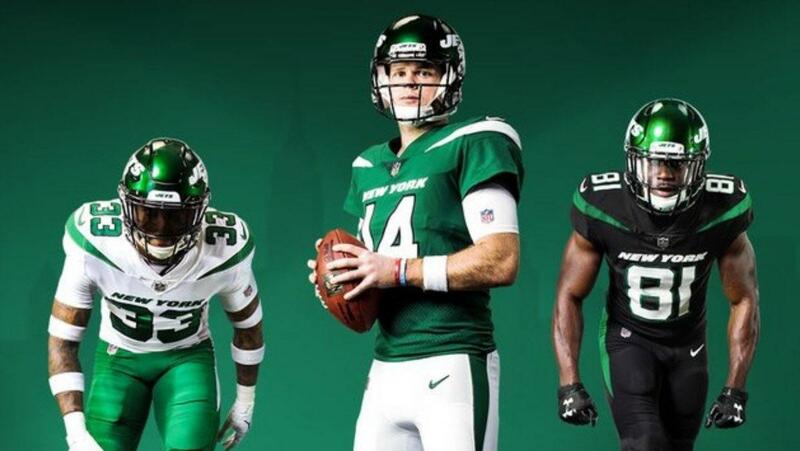 Starting in the 2019-2020 NFL season, the New York Jets will have new primary uniforms for the first time in 20 years. The franchise has had it’s ups and downs, but for the most part they have been very disappointing. This is the year they look to change this narrative with a promising quarterback under center along with new uniforms. While the old uniforms were classic, there were a lot of bad memories that came with them and the Jets have finally given their fans something to look forward to. These three new uniforms along with an updated logo were released on April 4th, 2019 at an event located in Manhattan, New York. This event featured Jets players such as Jamal Adams, Quincy Enunwa, Robby Anderson, Sam Darnold, Chris Herndon, and Leonard Williams modeling the new uniforms to get the fans excited. Also at this event included WWE superstars, both Jets current and former players, and multiple celebrities. Another addition to this rebrand that the Jets introduced is the signature slogan Take Flight which will be used throughout the stadium. This is a slogan used to get Jets fans excited for the future of New York Jets football and to revive this city that has been dull for years. The NFL and Nike came to an agreement that an up and coming Jets organization and their fans deserved new uniforms to honor the New York Jet tradition. These three uniforms feature the colors “Gotham Green”, “Spotlight White”, and Stealth Black” with the intent to rebrand the organization. New York Jets chairman and CEO Christopher Johnson commented on the Jets new uniforms saying “Our goal was to create a modern and innovative look for the future of our franchise”. He also said that he feels these uniforms will appeal to fans of all ages along with wearing these jerseys with pride. The “Stealth Black” uniforms are an addition that can be worn three times a year. The “Gotham Green” uniforms are basically a more updated and brighter green that were specifically developed for the Jets. The “Spotlight White” uniforms are classic white with a better and fresher look. New York Jets star safety Jamal Adams sees these new uniforms as a fresh start for the organization and states he believes they have a lot of swagger. While these uniforms are new and have Jets fans ecstatic, it is more of a symbol of a change of direction for the franchise for the better. With the new additions such as head coach Adam Gase and stars such as linebacker CJ Mosley and running back Le’Veon Bell, these fresh uniforms are a new look for a Jets franchise that looks to flip the script from their past that has for the most point left fans in disappointment. The change from the old white helmet to the new green helmet that includes “JETS” in white letters over the green is a perfect compliment to the new uniforms. Another addition to these new uniforms includes New York written on the chest for the first time in franchise history. This is a great addition because opposing teams and fans can see the city that these players play their hearts out for day in and day out which shows that they are playing for the city of New York. These uniforms are a perfect addition to a franchise that is trying to eliminate their bad reputation and make their fans satisfied by becoming relevant once again.